Find awe inspiring waterfalls and wondrous views across New York! New York is home to America’s earliest natural attractions. The granddaddy of all New York’s natural attractions and wonders, Niagara Falls, should be on everyone’s bucket list. One of the world’s greatest natural wonders, Niagara is America’s largest waterfall, (which we share with our Canadian neighbors) throwing 1.5 million gallons of water off 173-foot Horseshoe Falls every second of every day, and leaving viewers awestruck. Letchworth State Park, just 100 miles east of Niagara, is called the Grand Canyon of the East and once you see its sheer 600-foot rock walls and thundering waterfalls, you’ll understand why. Other majestic waterfalls include Central New York’s Rexford Falls, Oriskany Falls, and 167-foot Chittenango Falls, sculpted by glaciers from 40 million-year-old bedrock. Spectacular 45-foot-high Canajoharie Falls graces a fossil-encrusted gorge in 72 acres of woodlands, while High Falls Gorge, in the shadow of Whiteface Mountain, spills the Ausable River over ancient granite cliffs. Speaking of the Ausable River, it’s the proud mother of one of America’s original tourist attractions, Ausable Chasm, established in 1870, where natural attractions like Elephants Head, Grand Flume and Whirlpool Basin are best experienced in a raft or kayak adventure through the gorge. Throughout the Adirondacks you&apos;ll discover amazing scenery, with plenty of opportunities to hike, kayak, bike, take a gondola ride or even drive up Whiteface Mountain for spectacular views. In the Chautauqua Allegheny region, explore natural attractions of towering rocks and cavernous dens at Panama Rocks, where the tortured roots of ancient hemlocks snake between ancient rocks that erupt from the earth to 60 feet tall. If your jaw hasn’t dropped enough, stop by Natural Stone Bridge & Caves and follow Trout Brook under massive Stone Bridge, through Noisy Cave and into tranquil Artist&apos;s Gorge. One of the best cave adventures can be found 156 feet straight down at Howe Caverns, where eerie limestone formations, stalactites and underground rivers await. Nearby, a 100-foot underground waterfall awaits at Secret Caverns. On the shores of Lake Ontario between Rochester and Syracuse, giant clay formations known as Chimney Bluffs tower 150 feet, creating a dramatic shoreline of massive spires reached by nature trails. In the Catskills, The Shawangunks invite rock climbers to conquer a range of peaks over 3,500 feet in height. If you like shiny things, try the Herkimer Diamond Mines, where glittering quartz crystals can be easily “mined” from the earth. 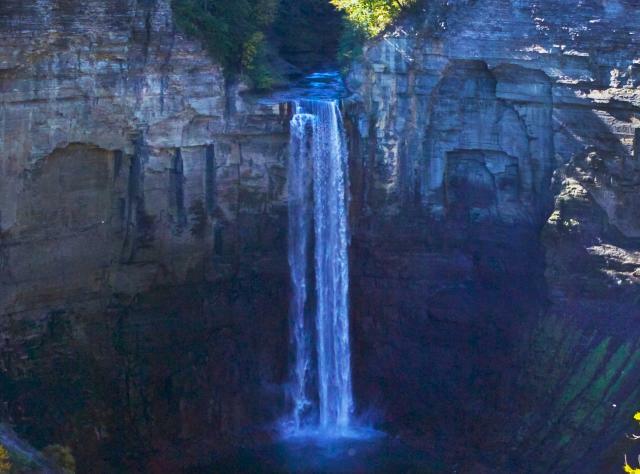 Which New York waterfall will be included in your next adventure? Search below to find top scenic destinations across the state now!